Perhaps the one thing which is completely different in our rooms is the bedding. 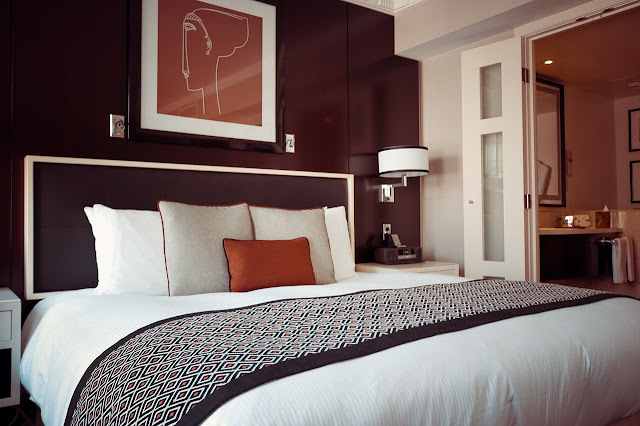 The fresh smell of the sheets, the pile of fluffy cushions, the comfortable yet crisp duvets are something that we expect in hotels, but not in our own bedrooms. The first step to fine living is investing in quality bedding. The bedding items used in hotels are, no doubt, a bit towards the pricey side, but there are plenty of other cheaper but high-end alternatives available too. Even if you do invest a bigger chunk of your money in the right bedding including linens, comforters and luxury hotel pillows, you will feel the transformation almost immediately. Hotel suites use a blend of two to three shades and this keeps things simple and elegant. For your own living space, you can use this same technique and develop your own color palette. Nowadays, darker oak brown tones are paired with beige and black, while white is added in for contrast. Be it paint or wallpapers, there are plenty of ways to define a custom color palette. Once your room is color-balanced, the chic-hotel room look will be the end product. You don't want things to clutter your room, especially not the furniture! Luxury suites designate areas for particular activities for instance, the bed for sleeping, the chairs for reading, the desk for working etc. Likewise, you can sort your bedroom space in the same manner and make a personal corner for different things. In case your bedroom is smaller than an average hotel suite, you can use that to your advantage by omitting further clutter and just decorating the corners. Colors won't be able to save your bedroom from the unnecessary boredom. For that purpose, textures and sophisticated artwork will help you. A small vase on the nightstand with a couple of your favorite paintings can do the trick for you. However, you need to be extra careful while doing the decor because chances are you might over-do them. Hotel suites are kept simple and that is why they feel light and wide. Another trick to add in some extra wow-factor is by hanging dark, multi-layered curtains, all while pairing the cushions with it. Lighting will determine the whole vibe of the room. Choose the wrong one and even the most expensive interior won't be able to save you! Be sure to make use of yellow light all while keeping the white lights for the bathroom. Consider installing a dimmer switch for mood lighting. If you are artsy, hanging in a crystal chandelier right above the bed can also add in to the luxury flavor. And while all the lighting is being discussed, don't forget to place your highest bet on the natural sunlight. The moral to this story is your bedroom is supposed to be your little heaven on earth. Your one time big, chunky investment will not only last long but will upgrade your living standard.